Behind every strong woman is an even stronger woman holding her up. The women who took the initiative to start the ARK of St. Sabina’s first female mentoring program know this to be true. They also know that in the Auburn Gresham community, young girls are in need of support and more importantly someone to look up to. They recognized that many of the girls in Chicago are diamonds in the rough, and are looking for someone who is committed to walking beside them, shining a light on their brilliance, and helping them to develop into the gem she was created to be. This vision became a reality when the G.E.M.S. Mentoring Program for Girls was launched January 2018 with 14 girls ages 13-17 and their 14 mentors. 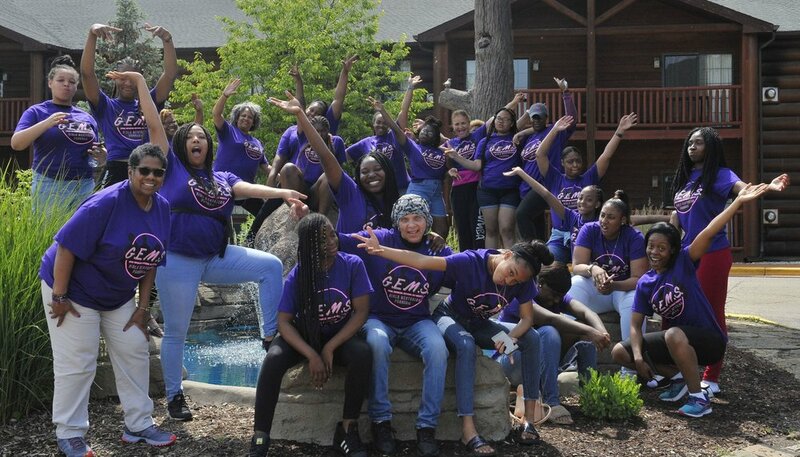 G.E.M.S., which stands for the spirit of Giving, Empowering, Mentoring, and Self Identity, began enriching the lives of 14 girls between the ages of 13 and 17 in January 2018. The ARK partnered with the nonprofit organization W.I.N.D.O.W. and its founder Valerie Goodloe, to develop a content rich curriculum. The G.E.M.S. model is designed to educate, inspire, and reshape the behaviors of teenage girls. Through bi-weekly group meetings, field trips, and weekly one-on-one mentoring, the G.E.M.S. team works diligently to ensure that each girl in the program gains a new understanding of her value and gets the support and resources she needs to pursue her dreams. G.E.M.S. have made several field trips including to a performance at the Chicago Lyric Opera, an overnight retreat in Utica, Illinois, and joined 18 other teen girls for three days in Knoxville, TN thanks to another partner, Purpose by Design. Life coaches and a host of G.E.M.S Angels (volunteers) lent their tireless support to this program. All 14 girls from our first cohort are preparing to finish the program at the end of this year, and several are returning as Big Sisters to the next group of G.E.M.S. mentees. The next cohort will begin in January 2019. The ARK of St. Sabina is home for G.E.M.S. weekly workshops, mentor training, meetings and events providing a consistent secure location for women who want to contribute to its success throughout the year. If you are interested in becoming a G.E.M.S. Mentor or a G.E.M.S. Angel, visit our website at www.thearkofstsabina.org/gems-mentoring/.